Home values suffered their largest decline in six months while existing home sales fell for the third consecutive week according to the National Home Sales Snapshot released by DataQuick. There were 253,359 properties sold over the previous thirty-day rolling period ending October 3rd, down 1.3 percent from the previous week’s total of 256,733 sold properties and 5.2 percent lower than the 267,316 properties sold four weeks ago. Sales volume was 6.1 percent below this year’s cycle peak of 269,817 sales which occurred during the 30-day rolling period prior to September 12th of this year. Last week’s home sales volume was still 16.0 percent higher than the 218,444 homes sold during the same period a year ago and was 51.2 percent higher than during the same period three years ago when 167,594 homes were sold. 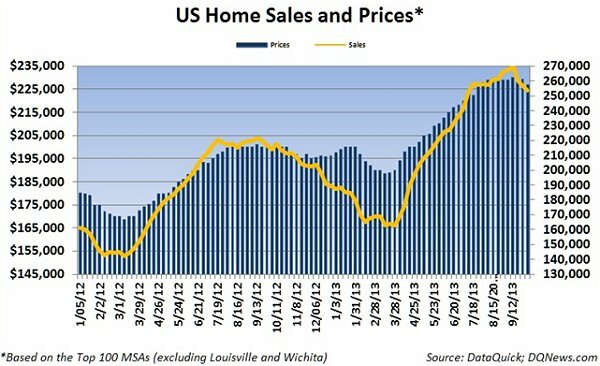 The median price of a home sold over the current thirty-day rolling period decreased by $2,500 to $227,000. It was the largest decline in home values since the end of February. Four weeks ago the median home price was also $228,837. Home prices were 13.5 percent higher than during the same period a year ago when the median price of a home was $200,000 and were 15.6 percent higher than the median price of $196,373 during the same period three years ago.